Hello. I'm a Pi Crust. 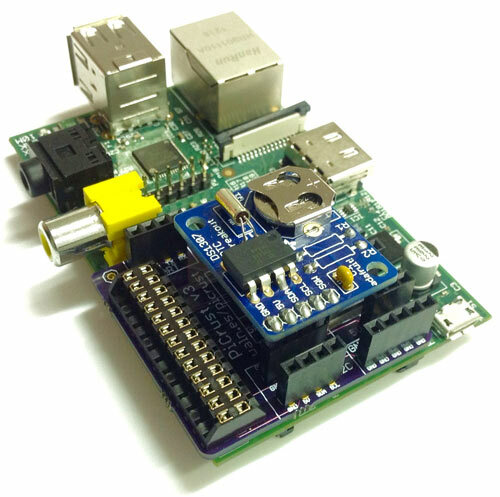 I connect electronics to your Raspberry Pi. The toughest part of my design was making me fit inside a Raspberry Pi. The existing Raspberry Pi headers actually go all the way through my board and I sits approximately 2mm above the Raspberry Pi (very close). It's almost as if I'm part of the original board. Because I sit so close to the Raspberry Pi, care has been taken to ensure that my thru-hole components avoid components on the Raspberry Pi board (so they don't short them out), and to avoid restricting air getting to the main ARM processor. Don't know how to solder? It's really easy. Check out the Soldering Is Easy comic. The prices above are in US dollars, in the minimum quantity available, and may have change since this page was written. Please check the websites for the most recent prices. The prices above many not include shipping or tax. When ordering, remember to check you've ordered the right quantity. Some of these parts require more than one. If you ordered thme PCB through OSHPark.com, there may be additional tabs attached to some of the edges of the PCB. You should remove these with pliers or cutters. Insert the big 26 pin connector into the board from the top. The top is the side with all the labels next to the pins. There is only one place the connector will fit. Flip board over and solder the 26 pin connnector in place from the bottom. 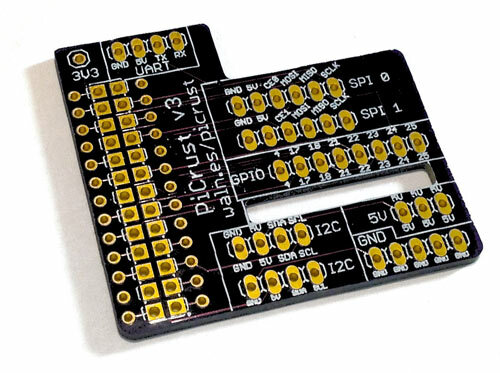 You'll notice there are 4 rows of holes - the outer rows are the ones you want to solder. The inner ones should be left as is, as that's how the Raspberry Pi connects. Flip board back over to the top and insert the remaining female headers. Flip over to the bottom to solder in place. Take the 1x2 male header and remove the metal (easiest with pliers). You don't need the metal part. You should be left with a little piece of black plastic. Break it in half. Take the two parts and glue them to the bottom of the PCB, in the spaces marked with little squares. 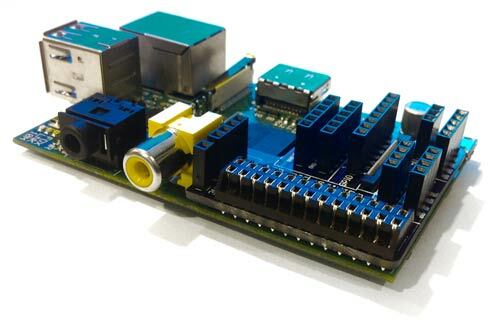 These act as little feet for the board to prevent it from pressing against the Raspberry Pi. The board clearly labels the pins. 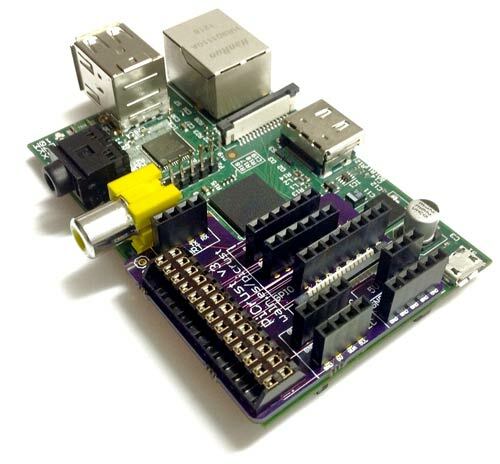 For details about interfacing with peripherals, see the RPi Low Level Peripherals Guide. Come visit the Pi Crust Google Group. Be nice to everyone. I am open source under the Creative Commons 2.5, Attribution, Share-alike license. Created by Joe Walnes in the igloo lab. Contributors: Mercedes Mane and Salman Mahmood. Website theme by orderedlist. Hosted on GitHub pages. 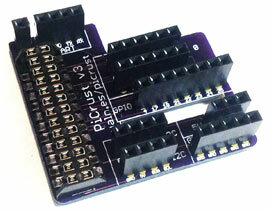 Drew Fustini noticed that the Adafruit Real Time Clock module has the same I2C pin ordering. You can slot it in directly. Joe Walnes: Blog, Twitter, Google+, GitHub.